It appears that Hellboy is back in the news again. It seems that Guillermo del Toro, director of the first two Hellboy movies, took to Twitter and created a poll to see if fans wanted to see a third installment of the film franchise. It would appear that the answer was a resounding yes. He stated on Jan. 18th, that if he got more that 100,000 votes, he would have a sit down with actor Ron Perlman and Hellboy creator Mike Mignola and discuss the possibility of making that film happen. Well, del Toro's 24 hour poll received over 130,000 total votes, with 32% say yes to the sequel, and 68% saying Hell Yes! I'm sure there will be some controversy with me saying that San Diego Comic Con Comics #2 is the first appearance of Hellboy. I'll get to that in a minute, but first let me tell you exactly what SDCC Comics are all about. 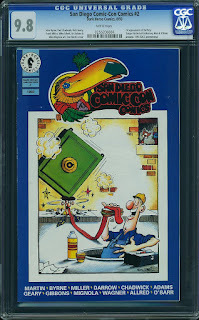 Between the years 1992 and 1995, Dark Horse Comics created a comic for SDCC that was given out as a promotion to attendees. If you've gone to one of the larger conventions lately, you'll know what I'm talking about. I've gotten a few convention exclusive comics, like the Wizard World Walking Dead #1 variants that were being handed out a couple years ago. 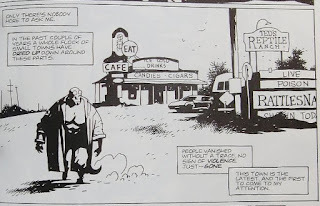 It was in the second issue that shows the first appearance of Hellboy, but I'll get to that in a minute. I'm going to start from the beginning. 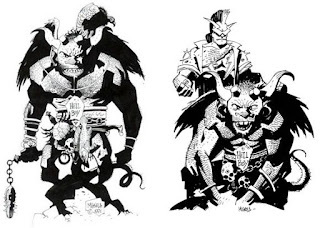 In the very beginning, creator Mike Mignola created some sketches that were his first idea of Hellboy. As you can see, these first sketches look nothing like the final version of the character. If you look, you can see that the characters name is written on his belt buckle. As you can see from the copy write, these sketches were made in 1991. Jump forward a couple of years to May of 1993. 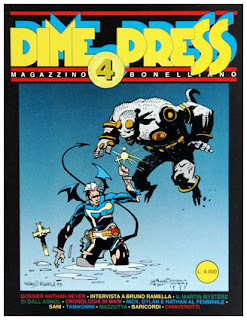 In the Italian comic Dime Press #4, you can see that his character has been further refined. This prototype of Hellboy isn't featured in any story, but only appears on the cover, and even though this version is much closer to the final version, his skin is blue and not the signature red color and he is lacking his long trench coat. 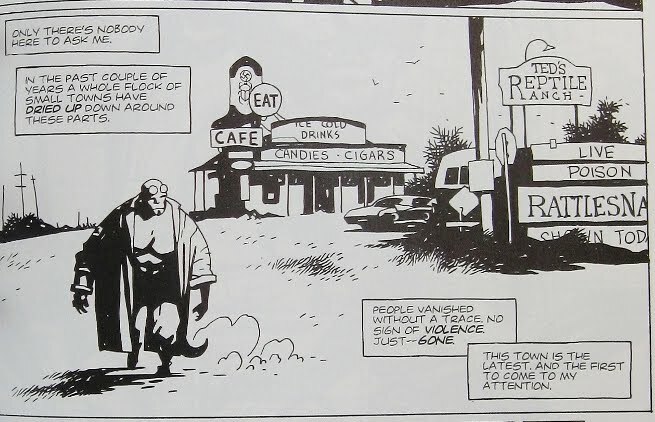 Mignola even claims that this is just a prototype, and not the actual first appearance of Hellboy. It would only be a few months later that we would welcome his actual 1st appearance. 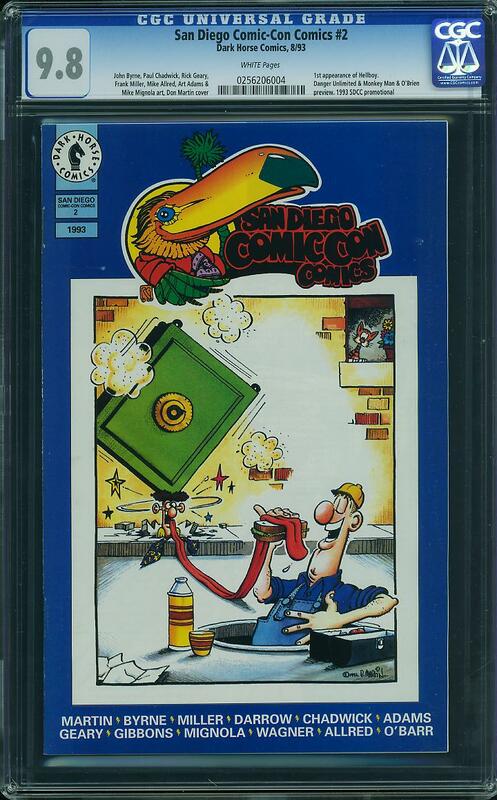 And here it is, in the pages of San Diego Comic Con Comics #2 that we have the first full appearance. Mignola's Hellboy story is one of many in this comic, so it's only a few pages long, but in it we get to see the finished character. This issue is only in black and white, so we really don't get to see him as the big red beast that he is, but he is sporting that trench coat in this issue. It wouldn't be until John Byrne's Next Men #21 that we finally get to see him in all of his full color glory. There are also stories from many other great artists in this comic, like Dave Gibbons, John Byrne, and Frank Miller, just to name a few. There have been 417 copies graded by CGC thus far. 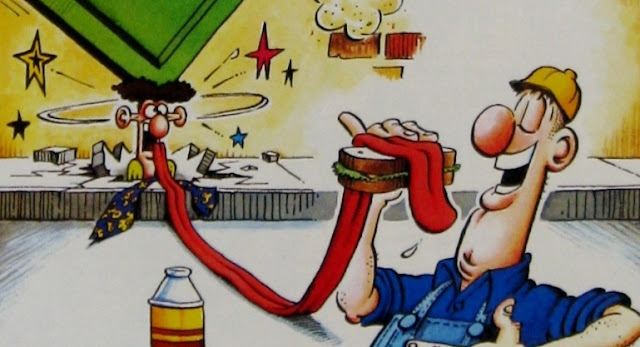 According to Recalled Comics, there were only about 1500 copies produced. Most of the copies that are in CGC's census are nice high grade copies. The lowest graded copy is a Signature Series 6.5 F+, and tops out at 9.8 NM/M with 119 copies. In fact, most of the already graded copies are in the 9.6 NM+ to 9.8 NM/M range, so there's no shortage of high grade copies out there. I also want to note that CGC recognizes this as the first appearance of Hellboy as well. Values for this comic has been on the down slope recently. 9.8 NM/M copies that were going for over the $400 mark in July of 2015, have come settled into the $250 - $300 range. It looks like the same thing has happened for most other grades too. There could be a couple of reasons for this. 1) Hype for the character has died down like it often does in todays market, and 2) people have started gunning for copies of Dime Press #4, thinking that is the first appearance of Hellboy. Even though DP #4 has a higher print run (around 2000) than SDCC Comics #2, values are quite a bit higher, perhaps because it's a foreign comic and harder to find. Either way, if a new movie gets confirmed, you can expect to see prices for both of these comics get another little boost in demand. I'm not saying that you'll get rich, but you could pull out a small profit to help fund that next comic that is on your want list.